The legal standard of the skills required of directors is usually framed in reference to the specific duties they have, leaving a void in the conceptualisation of the skills of non-executive directors (NEDs) who dominate the composition of ASX 100 company boards. The skills of ASX 100 boards are nevertheless a matter of public record through the disclosure of skills matrices. This article relies on case law to construct a model of the skills required of directors of large listed companies. 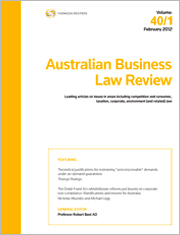 The model is applied as a conceptual assessment tool against ASX 100 company board skills and finds that there is a significant divergence between company-specific board skills and the legal conceptualisation of director skills. The article also finds that there is little consensus about a common skills set amongst ASX 100 company boards. There is a significant gender disparity, both in Australia and internationally, amongst individuals involved in price fixing and other forms of cartel conduct. An analysis of relative numbers investigated and prosecuted by the Australian Competition and Consumer Commission and equivalent authorities around the world in the late 20th and early 21st century reveals that less than 5% have been women. The reasons for, and implications of, this stark gender disparity have not been examined in any significant way. While the “glass ceiling” no doubt excludes many women from the types of roles typically occupied by competition law offenders, this cannot be the only factor at play. The rates of female offending have not risen proportionately with rates of female employment in senior management positions. This raises an intriguing question of whether, even when given the opportunity, women are less likely than men to engage in breaches of competition law and, if so, why? This article seeks to explore some of the potential reasons underlying the ongoing low levels of female participation in cartel conduct. For the PDF version of the table of contents, click here: Westlaw AU – ABLR Vol 46 No 4 Contents or here: Checkpoint – ABLR Vol 46 No 4 Contents.